While being involved in an accident with a big truck can be frightening, it’s important that you take certain steps at the scene in order to protect your rights under Florida law. Follow these 5 tips if you are ever the victim in a truck collision. If you are able, authorities must be notified of the accident right away. This is regardless of whether there are serious injuries or not. 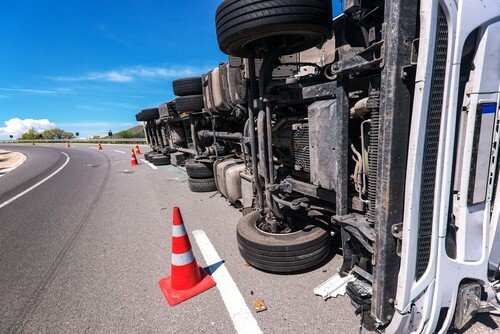 The truck driver may say they will pay for the damage themselves in order to prevent the authorities and their trucking company from learning about the accident, but it’s imperative that you call for help right away, no matter what. As soon as you can, even at the scene of the accident, start documenting everything. Write down the names of everyone involved in the accident and their contact information, including the truck driver and the trucking company he or she works for. Record vehicle damage, injuries, what happened right before the accident and everything you can remember. If possible, take as many photographs of the accident as you can. Take photos of the truck, your vehicle, all damages, and the injuries you and/or your passengers experienced. This can go hand-in-hand with writing everything down, but when it comes to proving injures and damage to a large trucking insurance company, or even a jury if the case goes to court, pictures truly are worth a thousand words. Take the photos now, while you can. When making your notes, pay special attention to the driver of the truck and his or her behavior. Is the driver acting very tired or even intoxicated? Does the driver appear to be under the influence of any drugs, or do you believe the driver was distracted by eating or using a cell phone while driving? These are important key points that will likely come into play later on during your case. Chances are, the trucking company has already contacted their own legal team as soon as they learned about the accident. It is in your best interest to call a truck accident attorney as soon as possible as well. At the Slonaker Law Firm, we can help you go head to head against big trucking companies, so you can get the full and fair compensation you deserve for your injuries. Call now for a consultation at (352) 629-6656.